The Agilent 16518A allows you to trace more channels with higher accuracy than ever before in a logic analyzer. The 64K deep memory lets you capture data over many clock cycles while retaining the highest multi-channel accuracy ever in a logic analyzer. Solve your toughest problems with the fastest, most flexible state analysis available. This expansion card requires the Agilent 16517A 16-Channel, 4 GHz Logic Analyzer High-Speed State and Timing Module. Features Find the Cause of Elusive Problems Verify the timing of critical edges with 250 ps resolution across up to 40 channels, or 500 ps resolution across up to 80 channels. Use the 1 GSa/s synchronous state analysis to view high-speed data streams across up to 80 channels. The Ultimate in Timing Resolution and Accuracy The 250 ps resolution of this analyzer is only part of the story. An innovative approach, using phase-locked loops, keeps the skew between channels to ± 250 ps. 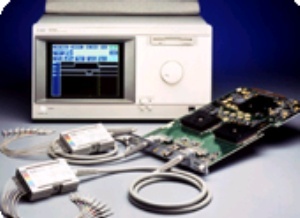 Precisely Characterize Setup or Hold Times The 250 ps precision (channel-to-channel skew) allows this logic analyzer to be used in place of an oscilloscope for characterization. The high channel count of a logic analyzer makes this a much more efficient process. Modularity Agilent Technologies modular 16500C family lets you configure your mainframe with the modules you need today, while providing you the flexibility to grow with your evolving digital design needs.